A bust to Mikhail Avagyan, a person directly involved in the occupation of the Nagorno-Karabakh region of Azerbaijan and adjacent territories, and in organizing the killings of Azerbaijanis in these territories, was erected in the Georgian settlement of Bugashen of the Akhalkalaki municipality on January 20. 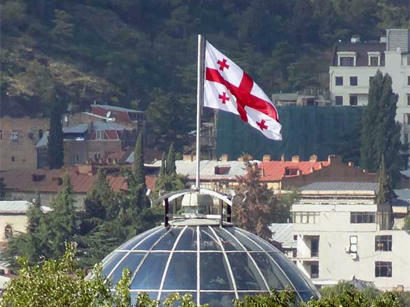 Gventsadze said that the Armenian separatist Mikhail Avagyan is the enemy of not only the Azerbaijani, but also the Georgian people, therefore this action is directed against Georgia and Azerbaijan. He added that the bust to the Armenian nationalist erected in Georgia should be dismantled as soon as possible. “Our countries are strategic partners, and Azerbaijan is a friendly country, which strongly supports Georgia, providing investment assistance, fuel support, etc. I am sure that attempts by third forces to drive a wedge into fraternal relations between Georgia and Azerbaijan won’t succeed,” he said. The Armenian separatist Mikhail Avagyan participated in the hostilities in Horadiz, Khojaly and Fizuli towns and was among those who committed genocide in Azerbaijan’s Khojaly town against hundreds of civilians who were brutally killed by Armenian militants. The ceremony of erecting the bust to Nazi Avagyan was attended by the mayor of Akhalkalaki Yurik Hunanyan, as well as MPs Enzel Mkoyan and Samvel Manukyan, according to Georgian media reports.